The alarming rate of concussions among football player of all ages. How do we reduce the incidence and severity of head injuries for even those players who have sustained repetitive sub-concussive hits? A fundamentally different approach to football helmet construction utilizing a flexible force-absorbing and force-dispersing shell. …helmets used in youth football have historically been scaled-down “little adult” versions of varsity helmets. Therefore, scaling down varsity football helmets fails to consider youth players’ impact conditions, developing spinal musculature, maturing brain, and head-neck disparity. And thus, today’s youth helmets may have energy-absorbing features that are not optimized for these lower dose impacts. Moreover, strategies, such as the use of semisoft energy-absorbing shell, viscoelastic padding…may have provided added protection via reduced energy transmission to the brain. It’s all about proper energy absorption. From a physics standpoint, Sicking said the rigid outer shell of a helmet doesn’t work well for absorbing the energy between two objects. The helmet itself needs to absorb more energy…The shell needs to be made out of a different material…What you would like to have is a helmet that flexes a little more and restores itself more slowly… The more time it takes the shell to restore its shape, the safer it becomes…Anything you can do to extend the duration of the impact motion is a win. It’s a redesign of the outer shell of the helmets that will make the biggest difference. Today’s helmets do a marvelous job of protecting against skull fracture. That’s something we almost never see anymore in our practice. And, helmets reduce the most serious inter-cranial bleeding — they’ve reduced that dramatically, by almost 80 percent. But they don’t do very much for protecting against concussion. That’s because the most injurious acceleration the brain can get is a rotational one, where the head is spun violently. The helmets don’t do very much at all about attenuating those forces. I’m totally in favor of better helmets, but unfortunately I don’t believe that helmets are the solution in terms of concussion. The solution, as suggested by former Cowboys quarterback Troy Aikman: Go old school. Until the NFL made the plastic football helmet legal in 1949, players’ headgear was made of leather — soft, relatively cushy leather, which protected, well, no one. Because brain injuries are internal, and often take years to manifest, football players usually give little thought to leading with their noggins. Were leather helmets to be implemented, however, nobody would do such a thing. Well, maybe they’d try for a game or two. Then, heads would turn bloody. Skulls would crack. Ears would bleed. And that would be that. …this study is the first to report on head impact exposure in youth football. Valuable insight to the head impact exposure in youth football has been presented. While youth football players impact their heads less frequently than high school and college players, and have impact distributions more heavily weighted toward low magnitude impacts; high magnitude impacts still occur. Interestingly, the majority of these high magnitude impacts occur during practice. Restructuring youth football practices may be an effective method of reducing the head impact exposure in youth football. These data are the basis of educated decisions about future changes to youth football and have applications toward determining guidelines for youth-specific helmet design. The case filed Thursday accuses Pop Warner of failing to monitor games, practices, rules, equipment and medical care “to minimize the long-term risks associated with brain injuries including repetitive sub-concussive hits”; failing to accurately diagnose brain injuries; and failing to approve the best equipment available. Pop Warner and the other defendants “acted with callous indifference” and players who participated in Pop Warner dating back nearly two decades are entitled to an unspecified amount of damages, according to the complaint. The concussion issues in sports have been a huge topic for years, especially in the NFL. A new study published by FAIR Health suggests that the issues have continued to become a huge concern across a range of youth sports in the United States for boys and girls. Now the National Collegiate Athletic Association is helping bankroll a project to gather the information. In partnership with U.S. Department of Defense, it has launched a three-year, $30 million project to track the effects of concussion using data from as many as 37,000 student athletes. The problem is ultimately one of physics. All helmets work under the same principle. The force striking one’s head–acceleration mixed with mass–can’t actually be prevented. Physics says that energy has to go somewhere, right? What good helmets do is lengthen the duration of the impact itself (in the hundredths of a second range), reverberating energy through various structures and materials, to smooth a hit from a sharp, high-g strike to a relatively smooth curve of deceleration. Consider landing on a concrete floor or a pile of pillows. Which impact takes longer and which impact hurts more? A study to be presented at a meeting of the American Academy of Neurology attempts to do exactly that, comparing 10 of the most widely used football helmets in drop tests designed to measure the kinds of forces that are most likely to result in concussion. The latest research finds that football helmets, which have been designed largely to prevent skull fractures and brain contusions, aren’t all that effective against concussion, which happens when the brain bounces and twists around inside the skull. Ergonomic design examines how well products, workspaces, and environments suit the people who use them. A usable design makes intuitive sense, and is physically compatible with the human body to promote productivity, safety and comport. This paper outlines the ergonomic design issues with respect to the design of helmets using bio-modeling. In this design approach, bio-modeling of a skull and a helmet modeling are interfaced with a reverse engineering method to develop a cost-effective way for the design of helmets with ergonomic fit to promote safety. The aims of this study were to quantify the sensitivity of various biomechanical measures (linear acceleration, rotational acceleration, impact duration, and impact location) of head impact to the clinical diagnosis of concussion in United States football players and to develop a novel measure of head impact severity combining these measures into a single score that better predicts the incidence of concussion. via Head impact severity measures for evaluating mild traumatic brain injury risk exposure. Steve James’s troubling new documentary, “Head Games,” reckons some of the terrible costs of modern American sports culture. Focusing on football, hockey and women’s soccer, the film looks at the widespread incidence of head injuries that threaten the well-being of competitors at every level, from youth leagues to the pros. Recent neurological research suggests that even mild and infrequent concussions can have terrible long-term consequences. Repeated impact, of the kind that is routine in football, especially, can lead to dementia and severe psychological disorders. Although less frequent, youth football can produce high head accelerations in the range of concussion causing impacts measured in adults. 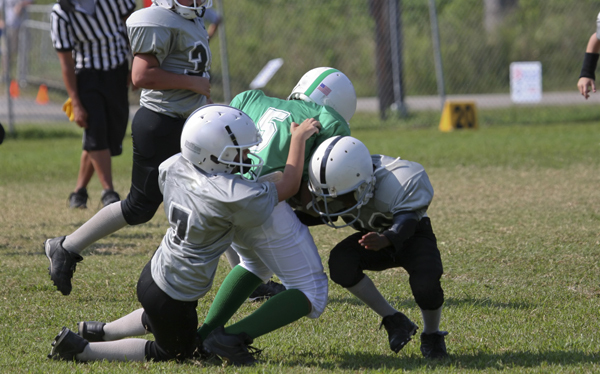 In order to minimize these most severe head impacts, youth football practices should be modified to eliminate high impact drills that do not replicate the game situations. via Head impact exposure in youth football. A growing body of research suggests that subconcussive head impacts or repetitive mild Traumatic Brain Injury (mTBI) can have cumulative and deleterious effects. Several studies have investigated head impacts in football at the professional, collegiate, and high school levels, in an attempt to elucidate the biomechanics of head impacts among football players. Youth football players, generally from 7 to 14 years of age, constitute 70% of all football players, yet burden of, and susceptibility to, head injury in this population is not well known. via Frequency, magnitude, and distribution of head impacts in Pop Warner football: the cumulative burden. High school football players suffer three times as many catastrophic injuries as college players — meaning deaths, permanent disability injuries, neck fractures and serious head injuries, among other conditions, according to a 2007 study in the American Journal of Sports Medicine. There is general agreement among the medical community that concussion incidence can be reduced through rule changes in play, changes in concussion protocol and procedures, and teaching proper hitting and tackling techniques. However, there remains debate as to whether the design of helmets can also help reduce the incidence of concussions.